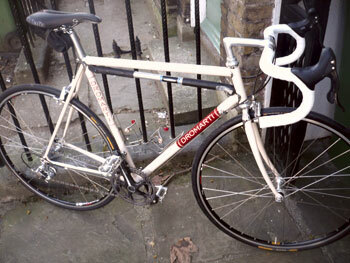 the dromarti strada is sold as a frame, a steel frame, and therefore is being tested as such. but frames don't move too well all by themselves, so there's a driving necessity to have other bits allowing smooth and silent pedalling action to enable the test/review to take place. there is an unashamed nod towards retro both in the frame's construction and paint scheme. cream and maroon is currently the only option available, though during the short period of the test, at least two folk suggested it might look nice in maroon with cream. while colour makes little or no nevermind to the ride quality, it surely affects the sense of pride in ownership. another option would be nice. the tubes are hand-brazed in italy into some very neat looking lugs, subsequently chromed, and just a smidgeon shorter than many seen in the heyday of lugged steel. there are no decals other than the dromarti name and 'life with passion' along the top of the top tube, but martin scofield of dromarti imparted that the tubing was all deddaciai. modernity is evinced purely in the simple but elegant form of the skinny tubes and chainstays; there has been no attempt to provide any oversizing, including at the headtube which is ye olde bog standard 1". 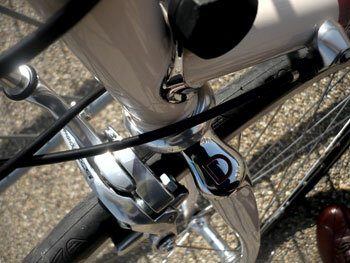 a rather tidy looking fork crown continues the flow of chrome to the gently curved blades. allowing for the truly retro obsessed, the down tube features braze-ons for old style downtube levers, though in this case, they had been obscured by bolt on cable stops for campag's ergopower. i truly wish more would pay heed to this nicety. ergo/sti levers are a godsend, but when it takes so little effort to build the frame in this mode, i find it a very nice option to have. 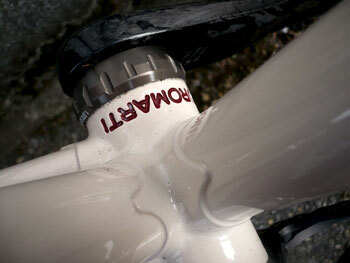 additionally, both front and rear dropouts were not only chromed, but embossed with the dromarti name. a neat touch. while many modern steel bicycles have left one inch behind, the strada not only embraces it, but aggressively so with a threaded steel steerer. how long since one of those was seen on a brand new set of steel forks? however, not everything reaches to the past: the groupset fitted was a campagnolo chorus 11 speed, with those new, sculpted levers, carbon cranks and external bottom bracket. it would have brought a warm glow to my armwarmers to have seen an aluminium chainset bolted to a square taper bottom bracket, but doubtless there are still a few hills too far. pleasantly, the excessive modernity from vicenza did not look ridiculously out of place on such a distinctly anti-modern looking frame. nudges towards the past were continued in the seatpost, stem and bars; it's many a year since campagnolo made those exquisite brushed aluminium seatposts with the logo etched at the rear, but martin had managed to source one very much to the bike's advantage. another example of italy having obviously no idea what they'd got till it had gone. threaded steerers are not going to have any truck with those awful looking aheadstems, but with cinelli having followed campagnolo in abandoning any semblance of style, it falls to nitto of japan to bring it all back. a very smooth copy of a cinelli 1a stem grabs hold of a pair of nitto silver bars, exhibiting that all too subtle reverse bend before heading towards the drops. beautiful. 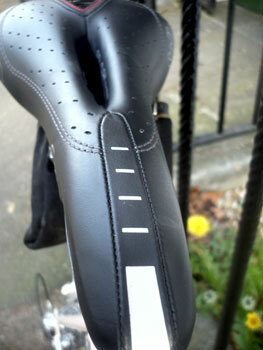 the saddle was a more than comfortable selle italia with a hole in the middle. the wheels were also in keeping with the overall flavour, utilising plain polished silver alloy campagnolo record hubs (whatever possessed them to anodise the latest offerings in black?) built thirty two spoke, three cross, to a pair of black ambrosio eyleted rims. the overall look was little short of magnificent. since i had planned to ride rapha's hell of the north as part of the review procedure, i had asked for a pair of 25mm tyres, and the rims bore a pair of continental gp 4000, a width which fitted between the rear stays with ease. most review bicycles spend a week or so on the hallowed isle, being pummelled by very unbilliard table like road surfaces, interspersed with frequent excursions across cattle grids. in this case, mohammed came to the mountain, day one being undertaken in the company of 399 be-tweeded cyclists. one look at the strada would confirm that, despite its retro looks, it's likely that a bit of speed would not be entirely out of the question. the tweed run provided none of that whatsoever. the test bike was a 55cm, squared at 55cm on the top tube. 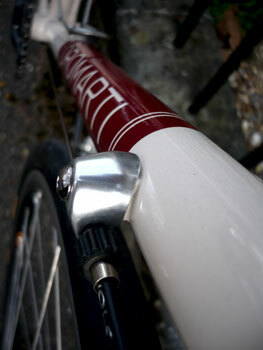 with a 130mm stem, the fit, for me, was ideal. while i had no need to raise or lower the stem, doing so is a far easier proposition than on the aheadstems we've all been conned into believing were the solution to a non-existent problem. 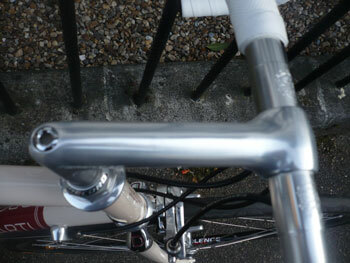 cycling's equivalent of an old wives' tale is that in while on the lever hoods, the bars should obscure the front hub. in practice that's actually a rather good way to gauge setup, and in this case, that record front hub remained out of sight completely. what the ride did provide was an uncommon opportunity to check out (very) low speed manoeuvrability over 14 miles of the capital's inner sanctum, a test, if it were such, that the bicycle passed with ease. many a drop bar road bike would struggle, and in point of fact i noticed one or two tweedies suffering in this manner aboard more modern style bicycles; indeed more than a few ancinet machines exhibited similar traits. the frame's balance was uncanny, so much so that the slow speed/stop/start nature of the ride made itself felt far less than i had expected. however, i doubt that many would be in the market for a machine of this genre to simply dawdle about the inner city. with a name like strada, speed is implied if not, in my case, necessarily effected to the nth degree. having missed the hell of the north, i was kindly taken for a dance across the north downs, south of crystal palace, where steepish uphills were, more often than not, followed by just as steep descents; the notions were of course reversed on the return journey. it is a customary feature of the sunday ride that members of the velo club sprint for the speed sign at the entrance to bruichladdich village, but other than pride, there is little to lose. a country boy in the big city confronted by erratically changing traffic lights, buses and taxis, has a deal more at risk. so the ability to wallop the strada from 0-60 in a matter of seconds could conceivably be a matter of life or death (ah, how i love melodrama). a lack of spring in the step would have been viewed as a dereliction of duty; move along now. nothing amiss here. in fact, for a confessed non-sprinter, this was rather fun, with seemingly more coming back than being put in. while my riding companion (also riding italian steel) was spinning a compact chainset, the dromarti was on 52/39, and though there were eleven sprockets at the rear, the teeth were concentrated more towards the small end. still, heavy, panting climbing action in an effort to keep up, resulted in no noticeable wobble in places where wobble should not be noticed. conversations taking place over the weekend regarding the efficacy of steel over carbon, and that of stiffness over just a bit of noodle, always ended in acceptance that a bit of flexibility in the bottom bracket was hardly something to be detested. the style of frame offered by dromarti is more than reminiscent of the merckx era. let's face it, if someone nicknamed the cannibal can wipe the floor with the majority of his competitors, riding lugged steel on a square taper with quill stem, is it not likely that even the very same is likely still too good for the rest of us? philosophical meanderings aside or included, i think we may have been duped over the course of the last decade and a half into believing that carbon is the one size fits all solution to everything. i'm as guilty as anyone else in this respect, at least initially; carbon is wonderful, but steel of this calibre feels every bit as good, even with a steel fork, and the practical aspects of steel for the rest of us, have fewer technological implications. with a frame and fork weight of around 1.7kg, the complete build can't hope to compete with sub 1kg carbon, but there's a lot more to a frame than its heft, something amply demonstrated in this case. climbing is never easy, but will be enhanced by a frame of learning; this was such. and what it may have given away in kilograms, it more than made up for in agility. i'm sure fighter pilots must feel this way; well, sort of. throughout around 50km of up and down, car doors opened on approach, jags pulling out as i descended more slowly than my compatriot, brakes, gears and handling were exemplary. everything the retro informed, modern cyclist could possibly want. sometimes the best result from a new bike is that you barely notice you're riding it, and in this case every box received a tick. i've tested a few bikes that quite literally need several rides to convince that they were anything other than just averagely good, but the dromarti strada took a heck of a lot less time than that. i rather wish that there had been more time available in the saddle, not because any aspect needed clarification, but just because i was having great fun, and i didn't want it to end. the strada frame, fork and campagnolo 1" headset retails at £1599, with the weight of same, a very respectable 1700g. 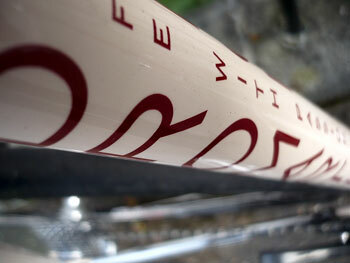 sizes start at 49cm and continue up to a 62cm for the tall at heart, and not a sloping top tube in sight. delivery time is, as martin states 'an italian twelve weeks' which, as many of you who have waited for dromarti's fabulously exotic leather shoes will know, is often a shifting period of time. currently the frames are not available in the usa, a situation that should hopefully soon be remedied.